The Castle of Queen Blanche is possibly the most overlooked French castle there is. In truth, it's barely a castle. And it's tucked into a neighborhood in the 13th arrondissement. The history is a bit murky. Its greatest claim to fame is the color red. Cardinal red. Scarlet red. The original building -- at the time in the countryside outside of Paris proper -- was built in the 13th century, most likely named after and lived in by at least one of three Queens: Was it Marguerite de Provence, the widow in morning after the death of her husband, King Louis XIV (Saint Louis), who had it constructed around the year 1290? She would have been known as a "White Queen" ("Reine Blanche") due to the white worn by widows in mourning. Other theories are that it was named for Blanche of Bourgogne (born around 1296), the wife of King Charles IV. Or Blanche de Castille, wife of Louis VIII and mother of Louis IX who died in 1252. Historians are also split on whether this is the building in the description of a grand costume ball when some wild, feathered "savage" costumes caught fire in 1392, killing several friends of King Charles VI ("The Well-Loved" or "The Crazy", who ruled from 1380-1422) and almost killing the king himself. This was the same year the king was said to have gone crazy, slaying four knights and attempting to kill one brother who were riding with him in battle. He had bouts of paranoia and of being delusional, sometimes believing he was made of glass. 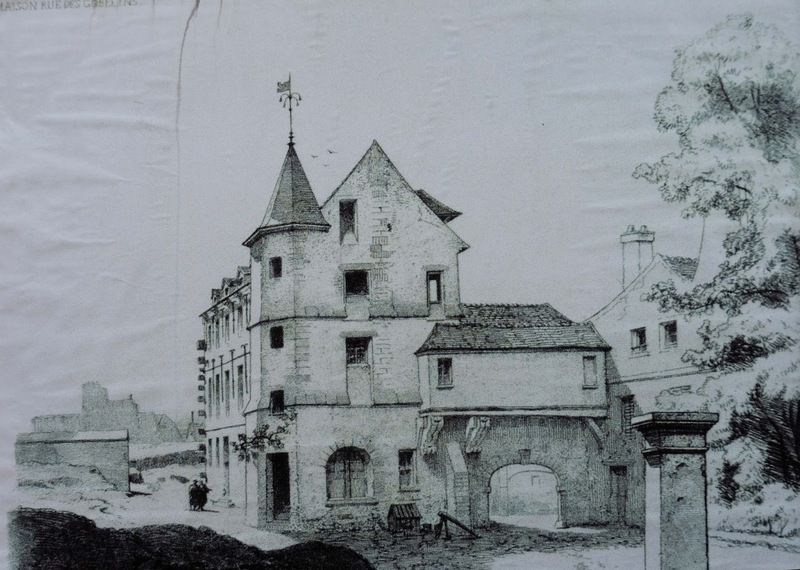 There is one written historical reference to Queen Blanche's castle from this time period, including a story of the fire, describing it as being "south of Paris" (which this would have been, till the area was incorporated into Paris borders in the 1800s).We do know that the original building was largely destroyed in a fire in 1392 and the remains were torn down in 1404. The current building, built on the foundations of the older structure, dates to the 16th century. It was built by the family Gobelin (now the name of the neighborhood, and the metro stop), who used it as both a residence and their place of business: a dying factory. At the time, the Bievre river, a small stream, really, and tributary into the Seine, ran right through the neighborhood and right next to the small castle. 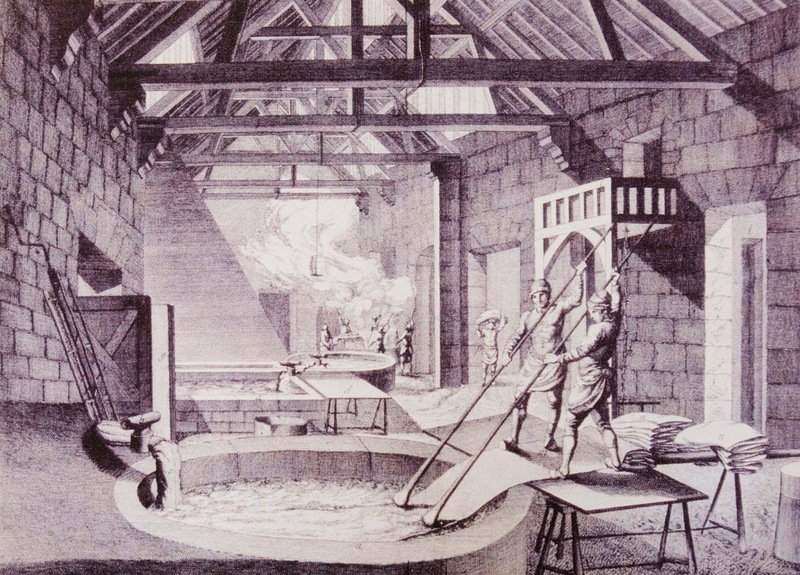 This is important in the Renaissance period, since water was required for the washing of fabrics and mixing the dyes. 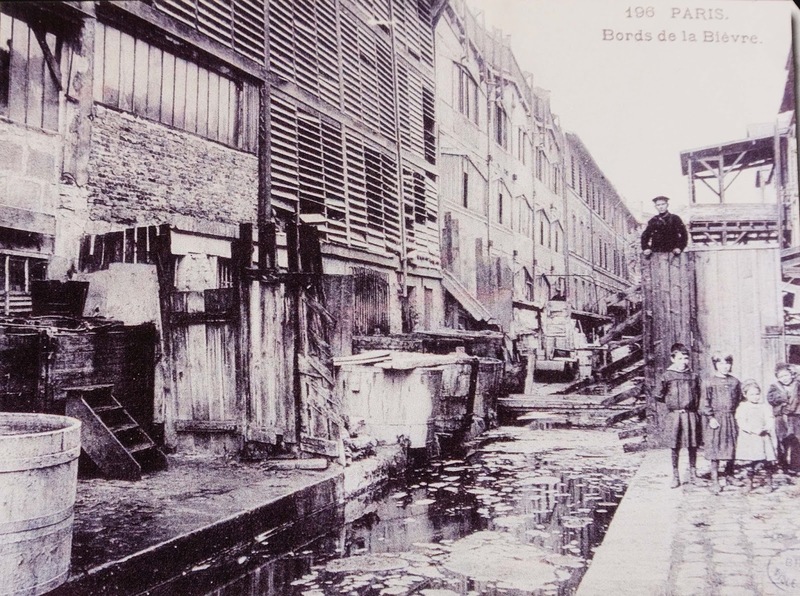 The fact that it was a small stream, which never flooded and which was easy to divert and manipulate (unlike the Seine) was an important factor: the stream could be split into two, allowing for mills from upper to lower levels. There are still canals dug out, now located in the current underground parking, that were used to channel water into the factory area and power horizontal mills -- that is, grindstones, used to grind up the materials used to dye fabrics. This "teinturerie" had not just local significance, but worldwide renown. And that is solely because of the color red. Whatever this factory used to make its scarlets, their reds were deeper, more glorious, and longer-lasting than everybody else's reds. That made it the fabric and yarn-dying factory of choice for kings and cardinals -- the religious kind, that is. The Pope in Rome, the Kings of Europe, even the highest nobles in the New World would pay dearly for this red. The family became wealthy, so wealthy that the castle was barely lived in more than a hundred or so years. 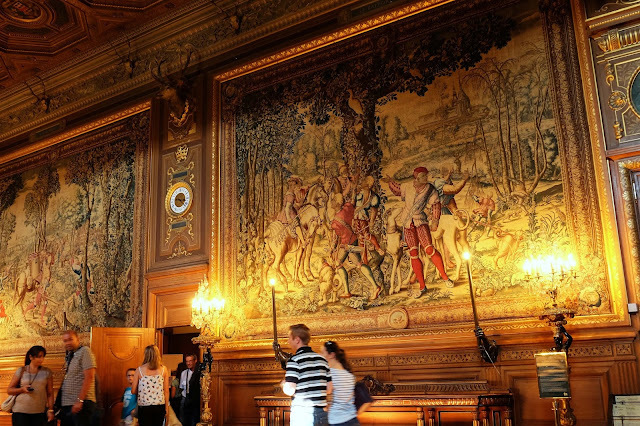 Soon, they moved to Paris, to be closer to high society, and also to make room here in the Chateau de la Reine Blanche for the dying and drying. It was so important to the Kings of France to have this rich red color, they were spared when the Huguenots (Protestants) were massacred in France (the infamous St. Bartholomew's Day massacre and aftermath of 1572). In fact, the Catholic Queen Catherine de Medicis (Italian widow of King Henry II of France, and mother of three French kings (in succession, as each brother died: Francis II, Charles IX, and Henry III) sent out troops to protect the Gobelin family and industry. If anything had happened to this factory, the Queen would have seen red, all right. In case you're wondering -- I know I was -- "cardinal red" is named after this scarlet red color that cardinals (and bishops and popes and kings) wear. The North American bird, the cardinal, is named after the color (not the other way around), because the gorgeous red male plumage reminded people of the cardinals' robes. So, in just about every old painting, when you see the red robes, you can assume that the threads and fabrics were died here at Les Gobelins. Now, the castle and surrounding buildings (restored and built anew) are gorgeous, with a very hipster, rustic charm. An architecture firm makes its home behind rustic wooden doors to the side of the castle. The tower in the castle serves no real purpose, other than to demonstrate the wealth of the family that owned the castle. They imported Flemish master carpenters to create this tower to nowhere. 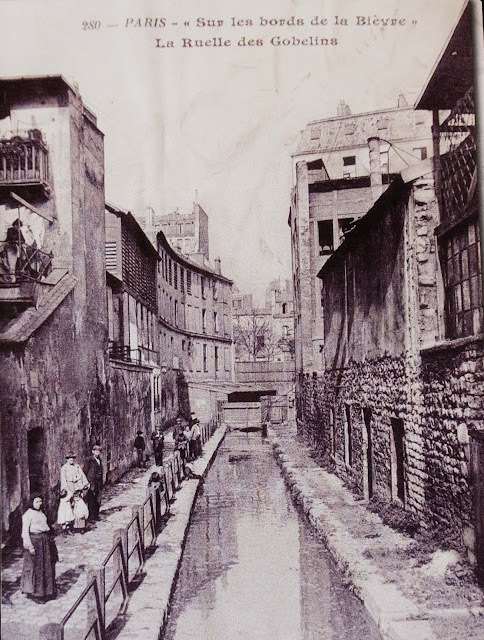 The neighborhood is built up now, the Bievre stream long-since covered over and paved. But the Chateau de la Reine Blanche still stands as a reminder when, frankly, scarlet was not just a color but a social phenomenon. The Tome du Moulis (which could be spelled Tomme du Moulis, but is not) is a hard goats' milk cheese made from raw milk in the Pyrénées. More specifically, it comes from Moulis, a town in the department of Ariège. But less specifically, it may not always be made of goats' milk. Tome du Moulis also comes in cow and sheep and mixed milk versions. The method of manufacture and the results are similar: the cheese is rubbed frequently during the aging process in order to obtain the hardened crust, gray when it's younger and ruddy brown when more aged. The interior, in the ariégeois tradition, may have holes in it, or it may be relatively smooth, like the sample I taste. It's a hard cheese, but one with a somewhat smooth and almost-creamy interior. Usually, the cheese is aged between 4-6 months, with a 2-month minimum. The flavor will get more pronounced with time, but even at the older end, it's not a knock-your-socks off cheese. It does have character, and definite hints of flowers and grass, but it's more on the sweet than the stinky side. From experience, I can tell you that leftovers make excellent grilled-cheese sandwiches. 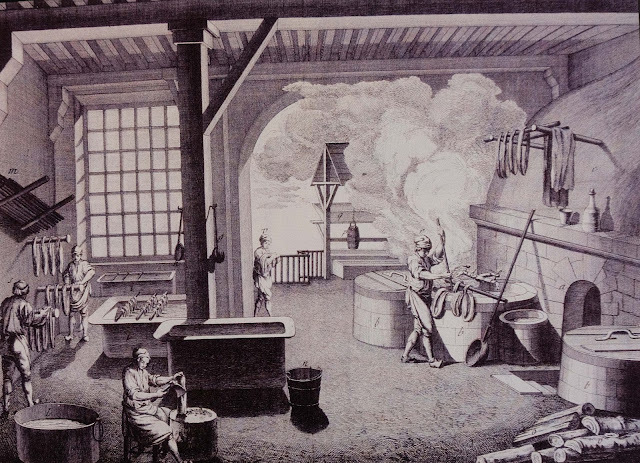 Mills and grindstones (moulins), powered by the local Bievre stream, were critical to the scarlet-dying process where ingredients -- including the secret scarlet ingredient -- had to be ground (moule). Unfortunately for me, Moulis is not the past tense, or future interieur tense, past participle, or even plus-que-parfait tense conjugation of the verb "mouler" -- to grind. It's actually a city name. But maybe if I went far enough back in history, the town was actually named after local mills, and there's a linguistic connection, after all. In any event, I have a back-up connection or two. I get this cheese from La Cremerie Royale, which specializes in obtaining ultra-high end and rare cheeses (and delivering them by mail. Genius). Some of their cheeses have literally graced the tables of kings past and present -- not the actual hunk they send you, of course, but rather the same kind of cheese. The same king who might have eaten this Tome du Moulis could also have worn scarlet fabrics, dyed at the Gobelins factory. And finally, it may be difficult to find a scarlet-colored cheese (but not impossible, thanks to some gaudy cheeses made with food dyes). The Tome du Moulis does have a reddish crust, but nothing close to scarlet. However, by coincidence, I do put this Tome du Moulis on a platter with some colorful splashes, thanks to a luscious batch of strawberries. They will not dye your fabric a royal scarlet, but they will stain your T-shirt red.